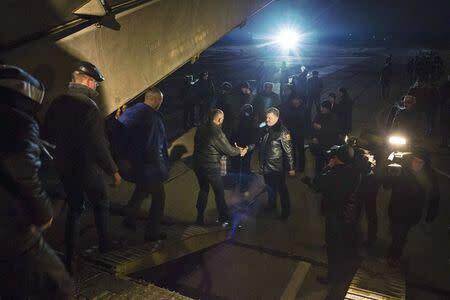 KIEV (Reuters) - Ukraine's government and pro-Russian separatists on Friday exchanged hundreds of prisoners of war while Kiev said it would suspend all train and bus service to Crimea, effectively creating a transportation blockade to and from the region. The agreement to swap 150 Ukrainian servicemen for 222 rebels followed peace talks between envoys of Ukraine, Russia, the separatists and European security watchdog Organization for Security and Co-operation in Europe (OSCE) on Wednesday. Ukrainian transportation chiefs said the reason for suspending train and bus service was the need to protect passengers due to a "deteriorating" security situation on the Black Sea peninsula, annexed by Russia in March. Crimea is controlled by Russia, but its only land link is with Ukraine and it has remained dependent on the Ukrainian mainland for most of its supplies, including much of its electricity and water. Ukraine already has banned sea and air traffic with Crimea, which is still serviced by Russian airlines. Other road transportation including passenger cars and trucks will still be allowed to travel into and out of Crimea. State rail company Ukrzaliznytsia said cargo trains would be suspended beginning on Friday, while passenger routes would gradually cease running over the weekend and on Monday. "The head of the SBU (security service) reported the release of 146 Ukrainians to the President. The SBU expects another four prisoners to be released tomorrow. They will all be able to celebrate New Year ... with their families," Svyatoslav Tsegolko, a spokesman for President Petro Poroshenko, said in a Facebook post. Earlier, an SBU aide had said they would hand over 225 rebels for the Ukrainian servicemen. It is not known exactly how many prisoners are held by the two sides, but Ukraine's military said this month about 600 Ukrainians were in rebel hands. In addition, Visa Inc and MasterCard Inc, the world's two largest credit and debit card companies, said they could no longer support bank cards being used in Crimea following U.S. sanctions imposed earlier this month. The United States last Friday prohibited U.S.-registered companies from investing in Crimea or providing services to companies operating there, among measures imposed over Russia's annexation of the peninsula from Ukraine. Russia's takeover of Crimea, an annexation Kiev does not recognize, pushed relations between Moscow and the West to their lowest point since the Cold War. The uprising by separatists began a month after Russia annexed the Black Sea peninsula of Crimea from Ukraine in March, following the popular overthrow of Ukraine's Moscow-backed president. The conflict has killed more than 4,700 people. Kiev's pro-Western government has said Russia orchestrated the rebellion in Ukraine's east, a charge denied by Moscow. Violence arising from Kiev's conflict with pro-Russian separatists has been confined almost exclusively to eastern regions of Ukraine and has not affected Crimea. 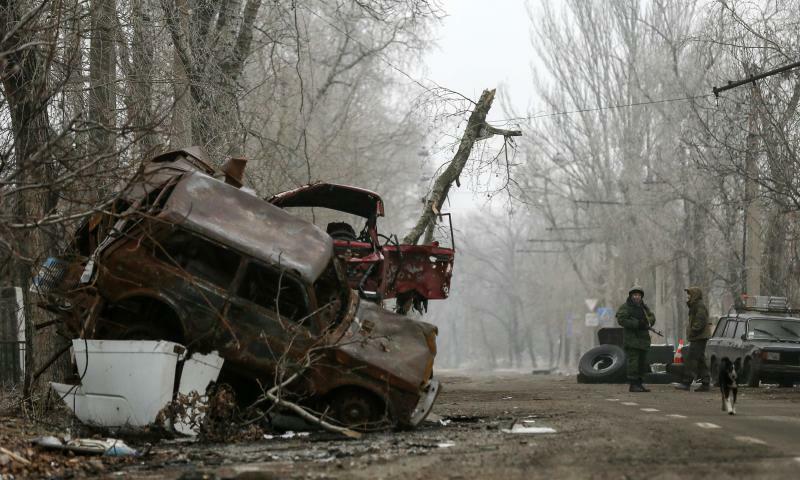 But the Ukrainian government has repeatedly warned of a build-up of Russian forces on the peninsula.